ETCulvert is a FHWA program developed in conjunction with ACPA as a Direct Method of design for the structural analysis and design of precast reinforced concrete box sections. ETCulvert completes structural analyses for loads due to box weight, soil weight, internal gravity weight, live loads and user specified surcharge loads. The use of cast-in-place design methods for precast concrete box sections can result in costly overdesigns. Developed to combine (3EB) structural calculations with (CAPE) Cost Analysis of Pipe Envelope and (LCA) Life Cycle Analysis. Pipe Pac helps you selec the right material for your buried infrastructure systems. The four Standard Installations are explained in American Concrete Pipe Association (ACPA) Design Data 40. These installations are for both embankment and trench conditions. Standard installations will provide enhanced installation performance as well as add economic advantages. By identifying suitable native soils for bedding, haunching and backfill, reduced costs of handling and trucking of waste material can be realized. Also expensive granular materials can be conserved. 3 EB is the Indirect Design Method (SAMM) using the new standard Installations. Fill height tables for standard (indirect design) concrete pipe utilizing the benefits of the standard installations is provided by the American Concrete Pipe Association. These tables will simplify improvements to existing fill height tables commonly used by specifying agencies. Developed to utilize the Life Cycle Analysis procedure to enable evaluation of different pipe materials bid as alternates for a project. This program considers project design life, material service life, economic factors and other factors such as traffic costs. Developed to allow specifiers and contractors to compare installed costs related to the differences in installation requirements for Rigid and Flexible Pipe. Cape allows the specifier to optimize his installation for structural or economic purposes. This flexibility produces an optimum installation considering the parameters of trench geometry, pipe bedding material, native soil suitability for bedding, haunching or backfill, compaction effort required, and compatibility of bedding material with native soils. ERIKSSON PIPE is a FHWA program developed in conjunction with ACPA as a Direct Method of structural analysis and design standards of concrete pipe sections with circular and elliptical reinforcements. The latest version of ERIKSSON PIPE allows you to design concrete pipe in accordance with ASCE, SIDD (Standard Installations Direct Design) and AASHTO design standards for the buried condition, using the Direct Design method. ASCE Standard ANSI/ASCE 15-93 Standard Practice for Direct Design of Buried Precast Concrete Pipe Using Standard Installations SIDD. This design procedure is now available to accurately evaluate the moments, thrusts and shear stresses in the pipe wall. 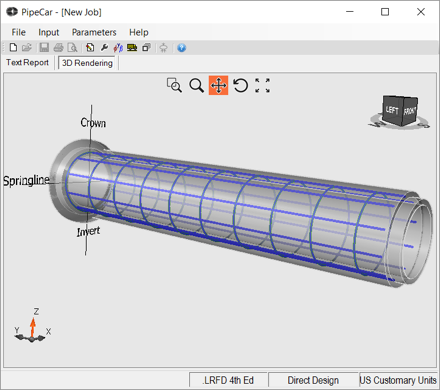 This design tool is used to design pipe specifically for use in specific conditions. Often high earth load situations. The Standard Installations are a significant improvement over the old B, C and D beddings that do not recognize or provide a number of practical installation parameters. Standard installations provide better guidance to installers by specifying zones, soil types and compaction levels required. Also the practical limitations of providing compaction under the haunches is recognized. A zone of lightly compacted material under the center third of the pipe to reduce stress concentration is a new innovation. Developed for indirect design of circular, elliptical and arch concrete pipe. This method incorporated the latest design method recommended by the American Concrete Pipe Association. New design parameters recognizing the improved understanding of soil pipe interaction such as the variable bedding factor and soil arching factor have been added to this procedure. Developed to assist specifiers in evaluating the design of new systems for the potential of H2S gas hazard and related corrosion. H2S gas generation can be avoided by following established design procedures such as maintaining self cleaning velocities. H2S gas generation is a public health hazard as well as a corrosion problem. This hazard can be eliminated by proper design. This H2S program allows a designer to identify potential problems in his design as well as to analyze existing installations to identify the source of H2S gas generation and propose possible remedial action.